release of vascular growth factors and cytokines [4,6,7]. ples were processed within 12 - 15 hours after collection. ed 80% - 90% confluence. pressed as a percentage of the control. Inc., Santa Cruz, CA) as the loading controls. groups were studied, taking p < 0.05 as significant. proliferated 48.6%, 28.3% separately. *P < 0.05.
higher than that at 7 d (see Figures 2(a) and (b)). CD34 (red staining in Figure 1) in the following days. quire laborious and time intensive culture techniques. 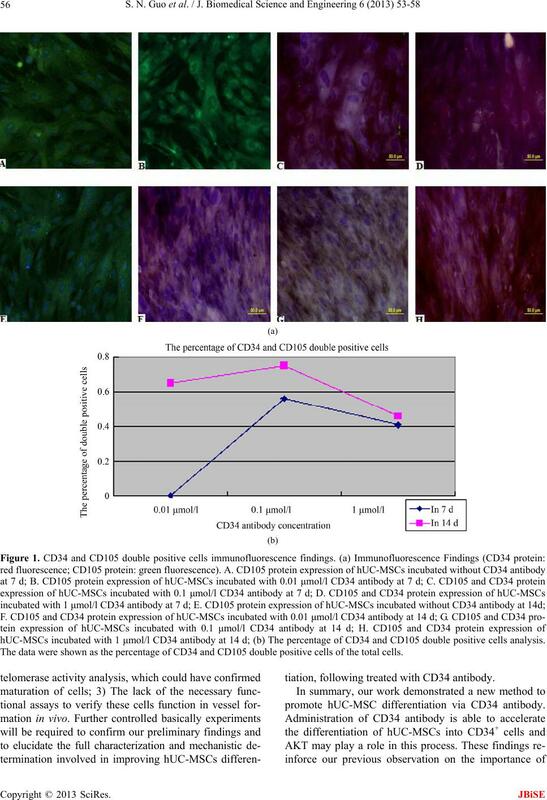 hUC-MSCs incubated with 1 μmol/l CD34 antibody at 14 d; (b) The percentage of CD34 and CD105 double positive cells analysis. 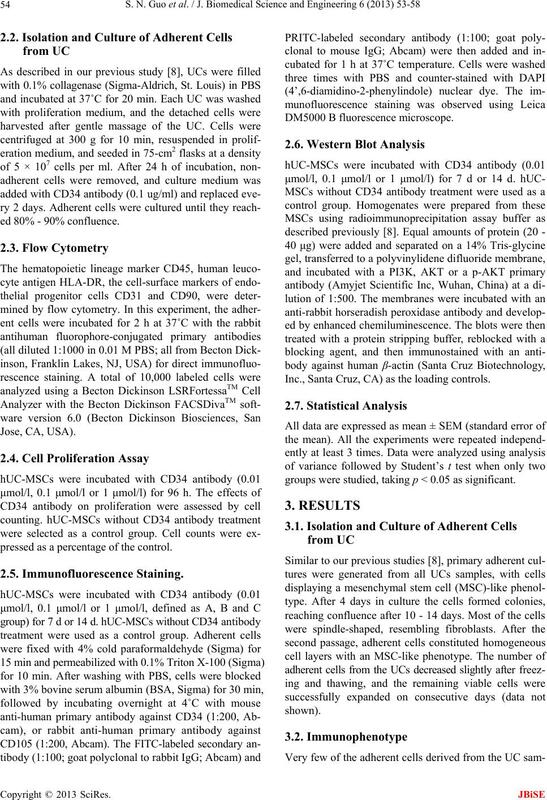 The data were shown as the percentage of CD34 and CD105 double positive cells of the total cells. tiation, following treated with CD34 antibody. 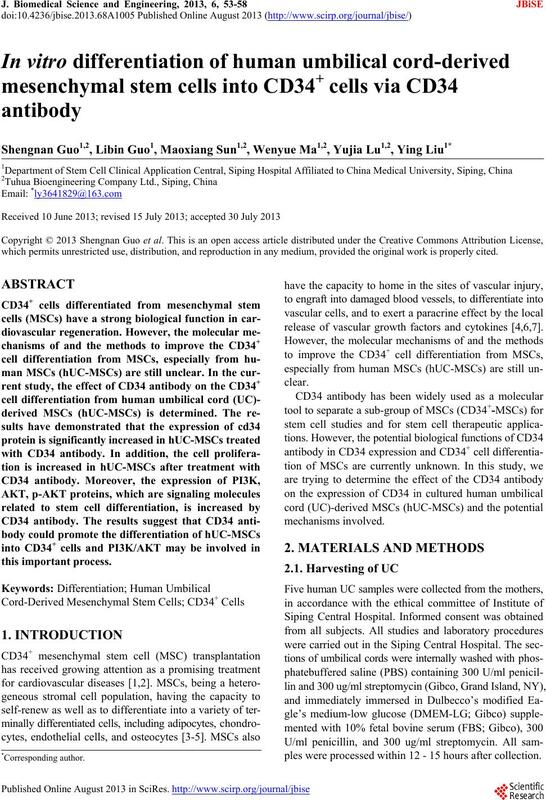 promote hUC-MSC differentiation via CD34 antibody. 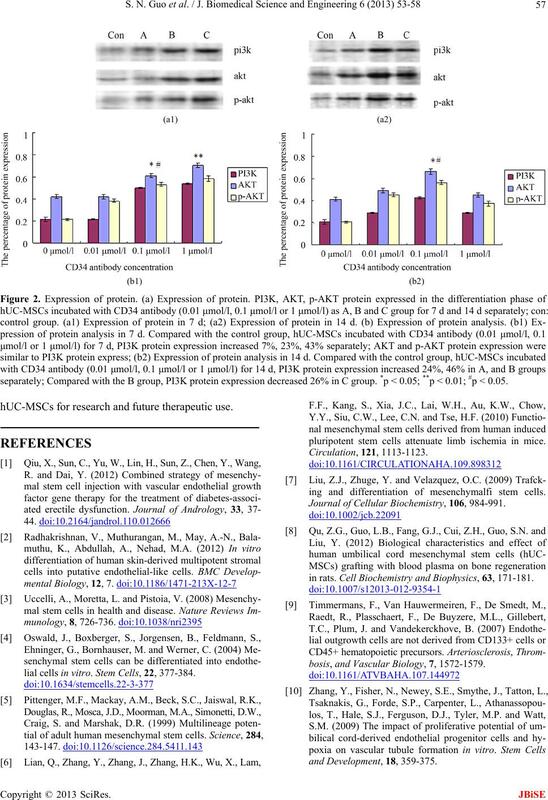 separately; Compared with the B group, PI3K protein expression decreased 26% in C group. *p < 0.05; **p < 0.01; #p < 0.05.
hUC-MSCs for research and future therapeutic use. lial cells in vitro. Stem Cells, 22, 377-384.
pluripotent stem cells attenuate limb ischemia in mice. ing and differentiation of mesenchymalfi stem cells. 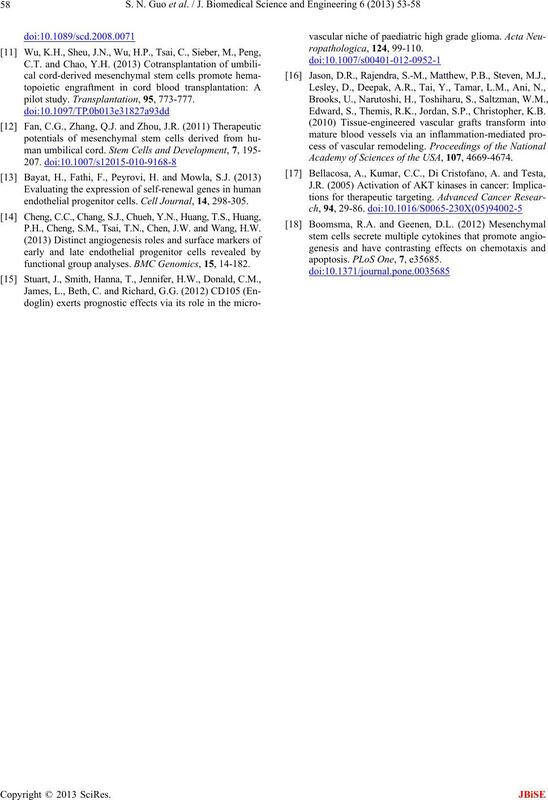 Journal of Cellular Biochemistry, 106, 984-991.
in rats. 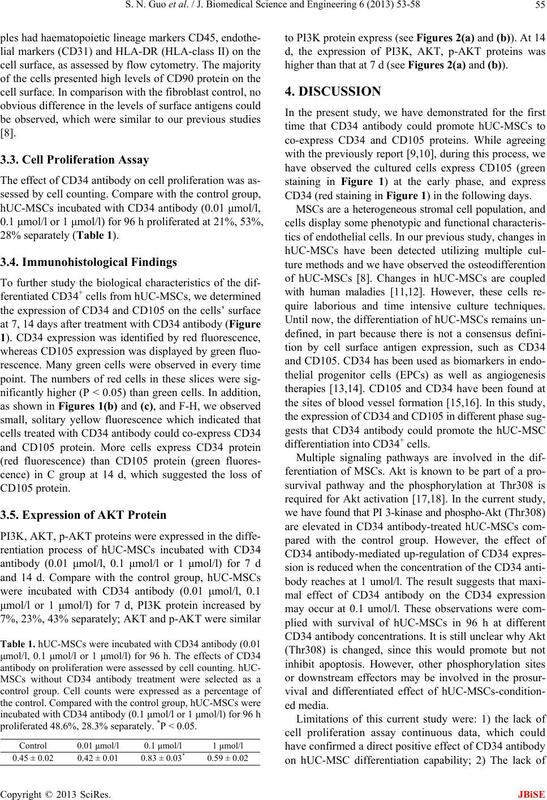 Cell Biochemistry and Biophysics, 63, 171-181.
bosis, and Vascular Biology, 7, 1572-1579.
pilot study. Transplantation, 95, 773-777.
endothelial progenitor cells. Cell Journal, 14, 298-305. P.H., Cheng, S.M., Tsai, T.N., Chen, J.W. and Wang, H.W. functional group analyses. BMC Genomics, 15, 14-182. Edward, S., Themis, R.K., Jordan, S.P., Christopher, K.B. Academy of Sciences of the USA, 107, 4669-4674.
apoptosis. PLoS One, 7, e35685.